This is a Pittsburgh story. No, it is not about the Steelers, Penguins, or Pirates. It is about a boy named Michael Charles… a boy that transformed many lives, including mine. While visiting grandparents over the Christmas holiday in Latrobe, Pennsylvania in 1993, Michael became sick. He was lethargic, vomiting, and had some diarrhea. Thinking it was just a stomach bug, I was grateful to see him finally sleep. Little did we realize how very sick he was, or the fact that he had an undetected genetic disorder since birth. Michael had been born prematurely, twenty-four weeks to be exact, living close to the edge of life. He weighed two pounds. Two pounds is hard to envision. He looked as fragile as tissue paper. Yet, week-by-week, progress was made in small increments. The week he was discharged from Hershey Medical Center I was petrified. Never did I feel so inadequate or insecure caring for someone. Once home, he flourished and grew as babies do. The sickness during the holidays was alter recognized as acidosis and catabolism. A rare disorder, glutaric acidemia-type1 (GA-1), was dormant until it was activated by a crisis caused by calorie insufficiency, dehydration, and an infection. This would be the start of a life-long medical journey. A serquatous path led us to travel around the world, literally. GA-1 is an autosomal recessive inborn error of metabolism. Protein, especially lysine and tryptophan, can’t break down to become energy for the body. They are converted into toxins in the bloodstream, in turn injuring the brain. This neurological insult can be life threatening and irreversible. For Michael, the results of his illness were destructive, reverting him back to a newborn stage. His dystonia movements reminded me of a person with cerebral palsy. Michael being unable to walk or talk or eat by mouth led to intensive therapies. As parents, we want absolutes—nothing uncertain. This would not be the case for Michael. Whether or not he would accomplish the most basic skills was a huge question mark. As he grew we saw to it that his life was full of activities. Once stabilized, we as parents involved ourselves proactively with efforts to alleviate suffering or injury of children with this rare genetic anomaly. So became the non-profit organization International Organization of Glutaric Acidemia (IOGA). The inspiration became reality. IOGA’s mission includes advocating for expanded newborn screening, hosting and sponsoring medical conferences, linking families with each other, and collaboration between clinicians, researchers, and parents. IOGA funded research for several years with doctors at Hershey Medical Center, investigating the possibility of stem cells to reverse brain injury of affected children. We were a resource tool, aiding parents in locating specialists to treat their children. Next came the inspiration of a winery. A one of a kind wine business set up for philanthropy. Named the Michael Charles Winery after our son, the business made monies to fund our nonprofit works. All profit after cost of goods was donated to our IOGA causes and mission. 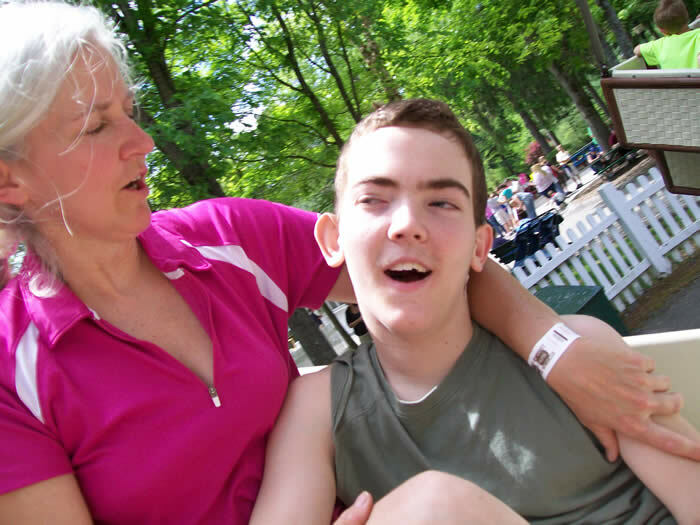 As Michael grew, so did his medical complications. The list was endless - full of surgery after surgery. Hips, legs, bowels, stomach. Thru it all he kept his smile and taught us all humility and compassion on a daily basis. Between surgeries, when he was well enough, we filled his life with “play.” This boy had a passport and traveled to Europe before he was three. Michael swam with dolphins in the wild (not at Disney) in Florida. He took hot air balloon rides, rode roller coasters, had a pool and a trampoline. Snow tubing and adaptive skiing and sledding were all part of his repertoire. Michael’s therapy camps took him to Canada, Mississippi, Chicago, and Pittsburgh doing conductive education with therapists from Budapest (the Peto Institute curriculum). Like any boy, Michael loved high speed trains, old western movies, swimming, jumping on the bed with his cousins, babysitters, and Mr. Rogers. What truly is mystical to me was that this boy did not eat by mouth, walk, or talk and yet he loved life. In all my travels in this world—of all my schooling, classes, and colleges—I will never have had a greater teacher or hero than Michael Charles. For 35 years Fred Rogers had been the father of our souls, reminding us that we are likeable just the way we are, reminding us that it’s a good feeling to know you’re alive and telling us we are special on the outside and the inside. That is what Fred Rogers and Michael Metil said to us each day. They made us want to be good neighbors. Michael inspired his cousin to become a special education teacher, his babysitter to become a nurse, his parents to start a foundation and open a winery in his namesake. As time passed by, so did Michael. He graced us all with his presence for 15 summers, dying in June 2009. At his funeral viewing service my Amish friend, Amos,, approached me and said, “No simple act of kindness goes unnoticed. Even if it’s a glass of water given to a child, it’s recorded in a book. Surely these children deserve the highest chair in God’s kingdom.” He would know. He buried two of his own sons with the same disorder. So in closing I tell you this: be the change and when you change, the world changes too. The IOGA 7TH Annual Golf Classic will take place on Sept 25, 2009 at the Latrobe Country Club. The IOGA Social will be on Sept 18, 2009 at The Clinic for Special Children, Lancaster, PA.